Musical comedies and operetta were a staple of British stage and screen in the 1930s. As well as the Jack Hulbert and Cicely Courtneidge films like Jack's the Boy (d. Walter Forde, 1932) there were the Herbert Wilcox vehicles for his wife Anna Neagle , like Goodnight Vienna (1932) and Bitter Sweet (1933). There were also Ivor Novello , Jack Buchanan , Tom Walls , Gracie Fields , George Formby - and Stanley Lupino , whose shows always featured frivolous young bachelors, gorgeous girls, country house parties and romantic complications. The genre afforded many opportunities for lavish sets, costumes and spectacle, and often had an exotic locale. In Glamorous Night (d. Brian Desmond Hurst, 1937) -music and lyrics by Ivor Novello - a gypsy girl leads her people in the rescue of the king of a mythical European state; the fact that the plot called for action on an ocean liner featured prominently in the publicity for both stage and screen versions. Evensong (d. Victor Saville, 1934) was set in Austria and featured Evelyn Laye as an Irish opera singer who gives up her career for love. 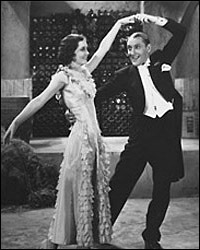 Chu Chin Chow (d. Walter Forde, 1934) was one of the most lavish of the shows. It ran on the London stage for nearly five years, from 1916-1921. Sidney Gilliat contributed to the screenplay. A Professor of Persian Art and Archaeology was consulted to ensure the authenticity of the sets and costumes. Fritz Kortner and Anna May Wong were in the cast and Gaumont-British spared no expense in presenting this Arabian Nights-style fantasy.